In an attempt to get work done I'm falling down the rabbit hole of the internet as I wait for iOS8 to figure itself out because I'm tired. I'm more tired lately than I have been because although Asher consistently wakes up at 6 a.m. every morning, I can't seem to get in a habit of going to bed early in order to accommodate such an early arising. Then again, we did just move houses and I did just spend the past two weeks sick (cough cough, hack hack), and I can't seem to figure out these mysterious hives that have plagued me for more than two months now. But yipeee! There are glimmers of hope in the cloud of exhaustion and coffee-fueled mornings in the form of ... subscription box-of-the-month clubs! You may or may not recall that I used to work for a gluten-free box-of-the-month club several years ago, but it looks like these boxes have not lost their steam. The market wants variety, it wants to try before you buy, it wants to examine quality, taste, experience before going all in. I'll be honest, it's an amazing world we live in when you can order something for minimal cost, wear it as much as you want, and then buy or return. It's like a revolving closet. When it comes to food boxes, the ability to sample something before buying an industrial-size box at CostCo is brilliant. 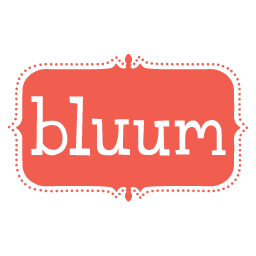 I'm currently subscribing to the first-month-free trial for Gwynnie Bee, which is a plus-size clothing subscription box, and the amazing folks at Bluum, goodies for mommy and baby, sent me a box to try out. 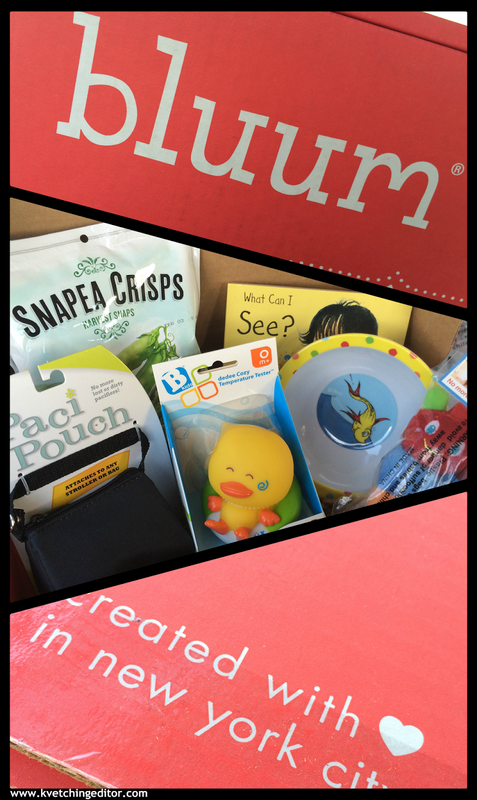 The Bluum box starts at $20.99 and sends goodies for mommy and baby from pregnancy through preschool. The great thing about this box is that it's customized for your baby's age, which means you won't get any toys or treats that Little Timmy can't use for the next year. There are a bunch of stellar plans (monthly, three months, six months, a year), and there's always free shipping. By and large I was happy with the box, although the treat that came in (dried snap peas) was not kosher, so unfortunately we couldn't use/eat those. There were two items in the box geared toward the pacifier crowd (a pacifier carrier to attach to a buggy or bag and a fuzzy worm to attach to a pacifier), which also didn't help us because -- lucky for us -- Ash never took to a pacifier or thumb sucking. The Dr. Seuss bowl was a treat after my husband's own heart, and the book was absolutely adorable. Ash took his first own solo bath last night (with me in the room, of course) and absolutely loved chewing on the bath temperature ducky. I also have to offer up mad props for the really clean, colorful packaging. It's nice to know what your'e getting the moment you see the box in your post! As for Gwynnie Bee, I couldn't have been more happy to find this box. There are a lot of really stellar clothing subscription boxes, but finding one that caters to the plus-size crowd is next to impossible. Oddly enough, even plus-size thrift stores/consignment shops has become quite the rage here in Denver. How does it work? You subscribe to Gwynnie Bee in one of three ways: get three items of clothing per month, two per month, or one per month. It's a bit pricey, so the one-month free is a genius idea that will tell you whether it's going to be "worth it" or not for you. You fill up your online closet with selections from their bounty of brands, sizes, and styles, and the clothing curators at Gwynnie Bee will package and send your clothes out depending on your subscription. Then, you can wear the clothing item as much as you want or send it back if it doesn't fit and they'll keep sending clothes out to you with free shipping and free returns. Talk about a dream closet, right?! Please ignore the earrings/head covering in the first photo. 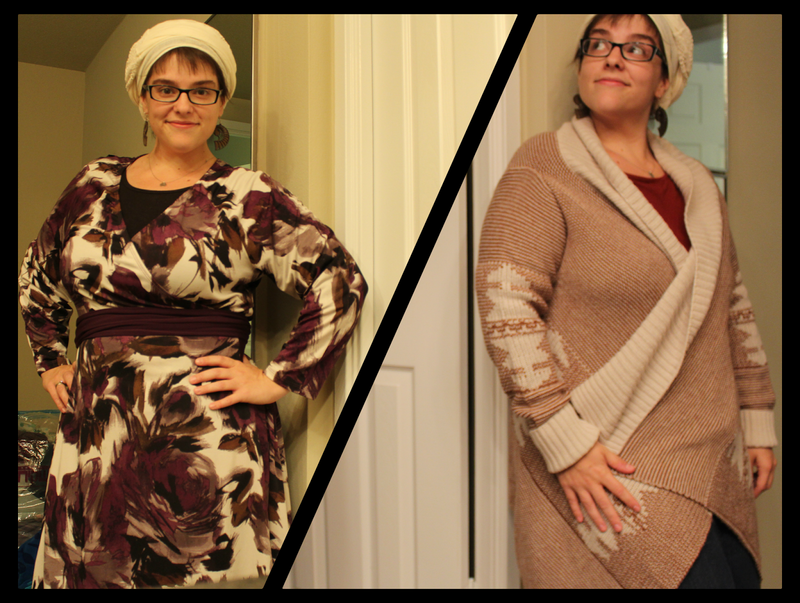 Of the eight articles of clothing they've sent my way so far, only one dress has really fit well and looked good and one cardigan is just cozy and beautiful. A third item, a beautiful black-and-white dress has the perfect cut (and pockets! ), but I need a smaller size. They've been really great about swapping out clothes quickly when something arrived damaged. But I do wish they'd rethink their packaging. One accidental slicing and you've cut the clothes. Will I continue paying the $79/month for a three-garment plan? I'm still not sure. It's a great way to try out a ton of different plus-size clothing brands in one easy go, but even with the discounts on purchasing the clothing prices are pretty steep. Designer plus-size clothing is crazy expensive for reasons I just don't understand. Do you have a favorite subscription box? 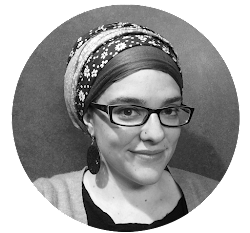 Have you been able to find any food-based boxes that cater to the kosher crowd?